It’s the Christmas countdown already at Pink Ginger Flowers! We all roll our eyes when garden centres and supermarkets start putting out their Christmas displays in September but here at P.G. I’m already planning my Christmas Wreath workshops and desperately making sure they don’t clash with my kids school productions! Details for all these events will be online soon and if you are interested in holding a daytime private wreath making workshop please email sarah@pinkginger.net. I can hold them at your home, the fox and Magpie or at my home, Pink Ginger Villas! I’m also excited to be starting doing workshops at Shipley Triangle, best known for its trendy craft beers and also sweet treats from Edward Street Bakery. My first workshop there is next Thursday 29th Sept. It’s giant jam jars, costs £20 and includes all materials. If you fancy it please email me to book on. This weekend I’m doing York’s Vintage Wedding Fair at the Merchant Adventurers Hall. Its the 2nd time I’ve done this fair and the venue is amazing! Look out for me there – I’ve got ginger hair and will most likely be wearing tights and red sandals! I’m also doing the Rose and Brown Vintage Wedding Fair on Oct 23rd at Victoria Hall in my home of Saltaire. This is a great opportunity to see what I do and chat about your forthcoming wedding. Very excited (and a bit nervous) to be doing a demo for Pudsey W.I. 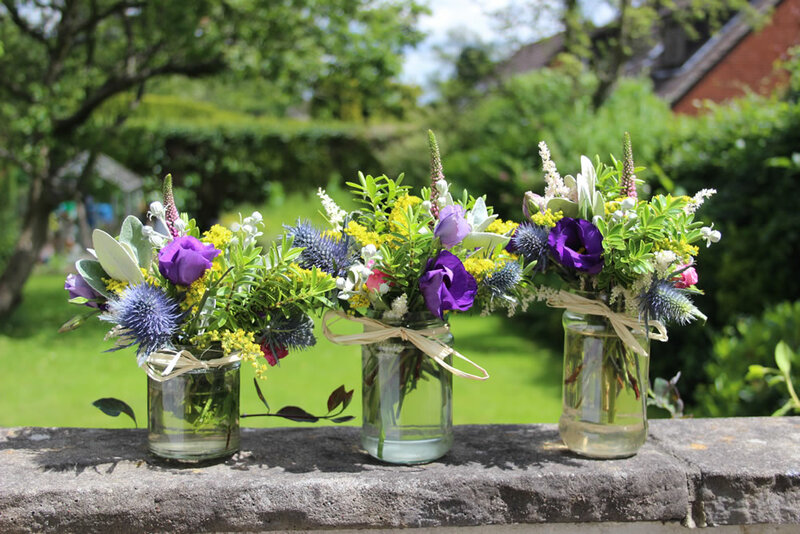 this coming Tuesday (27th Sept) I’ll be demoing 5 pieces including a hand tied bouquet, a jam jar and a wild style arrangement.